Bang is an After Effects plugin that lets you easily add realistic and stylised muzzle flashes directly to your footatge. Its 3D particle system renders unique flashes viewable from any angle, taking into account After Effects' comp cameras. Bang is a modular plugin allowing up to four different flash types and sixteen flash instances per layer, and includes the Bang Relighter module for simulating illumination of your actors and surroundings. 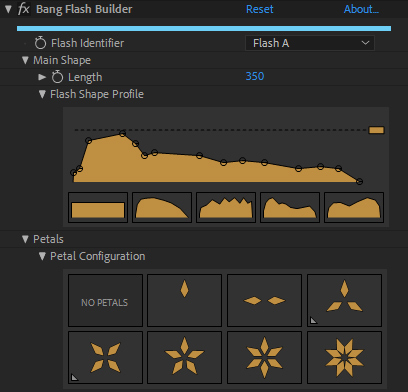 Create any flash shape with the Flash Shape Profile Editor; move points around, add new ones, or delete points to set your base shape, then play with the energy and randomness properties to fine tune the overall look. 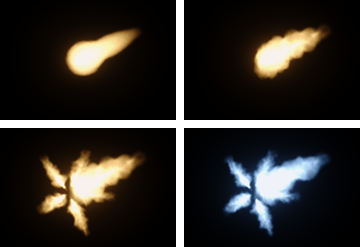 You can also add petals to simulate the star shaped flashes common on assualt rifles and machine guns, and sparks too! With up-to 16 instances allowed per layer, Bang gives you the flexibility to light up a huge gun battle with ease! Quickly position and orient your flashes using the EZ-Aim system, then keyframe the flash trigger with a single click. 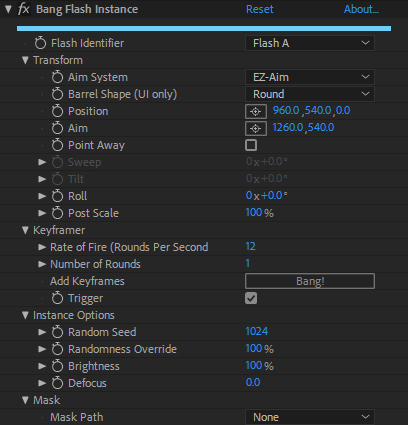 Using the trigger keyframes and position data directly from the Instance modules, and the flash colour from the Flash Builder modules, the Relighter module automatically simulates the light from the bright muzzle flashes illuminating your actors and location. The Bang effect, where each flash is rendered and composited into your footage also gives control over global properties, including glow and grain matching. Here are some of the bundled presets you can use in your projects, or use as a starting point to create new flashes! YY_ShockRing was designed to be a feature-complete plugin for making rings. Blend modes, thickness, feathering, opacity; YY_ShockRing has it all. Use it for shockwaves, motion graphics, or anywhere else you need rings. Origami is the procedural mesh generation and animation tool for After Effects. Create stunning effects like unfold and organic growth in a few clicks! The next generation of scopes and monitoring for grading in After Effects. Simple backup and restore of After Effects projects. Now with support for After Effects CC! Apply log-to-lin LUTs to your log-encoded footage in After Effects, just like in Nuke!